(Christopher Bergland, author of “The Athlete’s Way”) When was the last time that you had to perform gracefully in a high-pressure situation? How did you handle it? Did you choke or did you have grace under pressure? Researchers continue to confirm that daily habits of mindset and behavior can create a positive snowball effect through a feedback loop linked to stimulating your vagus nerve. In this entry I will show you 8 habits that stimulate healthy ‘vagal tone’ and allow you to harness the power of your vagus nerve to help you stay calm, cool, and collected in any storm. Heart disease is the number one killer in America. One way to improve your heart health is to focus on the vagus-friendy lifestyle habits I explore below. Well conditioned athletes have higher vagal tone because aerobic breathing creates healthy vagal tone, which results in a lower resting heart rate. 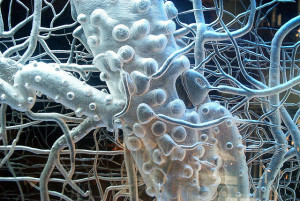 Healthy cardiac function is directly linked to stimulating the vagus nerve. The word vagus means “wandering” in Latin. The words vagabond, vague, and vagrant come from the same root. The vagus nerve is known as the wandering nerve because it has multiple branches that diverge from two thick stems rooted in the cerebellum and brainstem that wander to the lowest viscera of your abdomen touching your heart and most major organs along the way. The vagus nerve is constantly sending sensory information about the state of the body’s organs “upstream” to your brain. In fact, 80-90% of the nerve fibers in the vagus nerve are dedicated to communicating the state of your viscera up to your brain. When people say “trust your gut” they are in many ways saying, “trust your vagus nerve.” Visceral feelings and gut-instincts are literally emotional intuitions transferred up to your brain via the vagus nerve. As with any mind-body feedback loop, messages also travel “downstream” from your conscious mind through the vagus nerve signaling your organs to create an inner-calm so you can “rest-and-digest” during times of safety or to prepare your body for “fight-or-flight” in dangerous situations. In addition to visualizing my vagus nerve I literally talk to it in the third person like it is a separate entity. You can try this too the next time you have the butterflies or are shaky before a big presentation or challenge. I will literally say to my vagus nerve things like, “I thought we were in this together. I need you to work with me here. Come on! Don’t let me down.” Somehow this helps take my ego out of the situation, puts me at ease, and makes me feel like I have a loyal comrade on deck. Try this trick the next time you need grace under pressure and see if it works for you. 2. Practice, Practice, Practice. In a Psychology Today blog entry called No. 1 Reason Practice Makes Perfect, I wrote about the power of your cerebellum to store muscle memory and allow you to perform gracefully under pressure. Without extensive practice we are forced to rely too much on the ‘executive function’ of our prefrontal cortex. Anytime you ‘over-think’ your performance you are more likely to choke, fumble and drop the ball. Arthur Ashe called this “paralysis by analysis.” Once the cerebellum is running the show your vagus nerve engages which helps create fluidity in your thoughts and actions. 3. Create Flow by balancing skill and challenge. The key to being in the ‘zone’ or creating a state of ‘flow’ is to find the sweet spot where your skill level perfectly matches the challenge. Get in the habit of continually nudging against your limits. By increasing the challenge gradually you become more skilled and comfortable with more difficult tasks. Seek challenges that keep you nestled between anxiety and boredom. The key to peak performance is to have a heightened state of arousal but an inner sense of calm reflected in a perfect dynamic tension within the yin-yang of your autonomic nervous system. Although it is tempting to bite-off-more-than you can chew, your vagus nerve can betray you if it feels you’re in uncharted territory. By consistently increasing your skills you will feel at ease as you take on bigger challenges. That said, if you ever do have the opportunity to leap frog to a high-stakes challenge, use other techniques here to harness the vagus nerve and use it as an ally to get you through. Before you face any challenge or test that fills you with performance anxiety get in the habit of reframing the importance of the event by putting it in a broader perspective of other things that you’re good at and what matters most to you. Even when the stakes are high, remember that every hurdle is an opportunity to learn. Mastery is a process. Overblown performance anxiety jacks up cortisol and andrenaline levels and makes you less likely to succeed. 5. Use neuroplasticity to re-wire habits of positive thinking. By generating positive emotions and a learned optimism you will ‘fire-and-wire’ together neural networks associated with a mindset that will give you grace under pressure. The vagus nerve picks up on signals coming from the ‘top-down’ and from the ‘bottom-up’ and uses these signals to re-wire your mind through neuroplasticity. It is hoped that the device will stimulate release of the brain’s own chemicals and help the brain form new neural connections which might improve participants’ arm mobility. In 2005, the FDA approved the use of VNS for treatment-resistant depression, although it’s use remains controversial… VNS is also used to treat epilepsy and tinnitus. Dr Dawson added: “Evidence from animal studies suggests that vagus nerve stimulation could cause the release of neurotransmitters which help facilitate neural plasticity and help people re-learn how to use their arms after stroke, particularly if stimulation is paired with specific tasks.” The link between vagus nerve stimulation and neuroplasticity is strong. By focusing on creating healthy vagal tone you can trigger similar neuroplastic changes from the bottom-up. Creating a mindset of grace under pressure can be reinforced through the powerful mind-body connection of the vagus nerve. If you are unable to remove yourself from anxious or nervous people (like in a waiting room for an audition or near the starting line of a race) I recommend using headphones with music that creates an appropriate mood and blocks the ability of others’ anxiety to affect your vagal tone. You can also close your eyes and do mindfulness or meditation maneuvers to distance your vagal nerve from picking up the nervous vibe of people in your vicinity. Obviously, people who emit easy-going, warm, upbeat emotions are much better for your health, longevity, and ability to perform with grace under pressure. Seek these people out! Equanimity (link is external) is a core tenet of many ancient philosophies and religions. Equanimity is defined as “Mental calmness, composure and evenness of temper, especially in a difficult situation.” Equanimity has its biological roots in the vagus nerve and is synonymous with grace under pressure.